More like "Subject OH YEAH!" Why not 6hp to make the card even stronger in an infesting Genestealer deck. These plus the Venomthropes give the Tyranids a very strong command presence. It's a delicate issue. 1 hp would have made it too easy to kill for a 2 cost unit with a situational boost. Being a 2/2 is correct, except in a Genestealer deck, where it is boosted. Sadly, 1.5 hp is not possible. It's a great card, and I am happy that it's just 2 cost, not the 3 cost we came to know as the other Bonusguys ( Skull flayer , Templar Tech Marine, Tau guy and Chaos Cultist ). Comparison point here is Eldar Survivalist: both are 2 cost with the same number of command icons, HP and command boosts. Survivalist loses out on attack, but can be flexibly assigned to any planet. Harvester has better traits, of course. Context-wise, Survivalist benefits from being in the same build as Superiority and Eldorath. 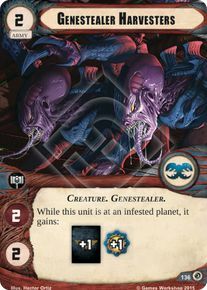 Harvester benefits from being one of a mere handful of 1 command for 2 cost cards in the Tyranid card pool, and so will almost certainly merit inclusion because Tyranids needs affordable command presence so badly. Play him, send omega there, use your Nesting Chamber to infest and your saelum to grab up to 3 cards or resources independent of command. And if he joins the warlord train you can just keep doing that. I find myself having to take out Venomthropes in order to fit Harvesters in it. There's simply no room for all those 2 cost units to coexist. I wonder if I am alone in this. Venomthropes takes too long to infest compare with other cappers and with Harvesters and Nesting Chamber you can do a turn 1 infest with Omega. As a matter of fact I have scaled back and may even remove Predation since a few Genestealers and Chambers is enough to infest any planet you want at action speed. Well, unfortunately the extra card and resource only applies to command struggles. Sacellum Infestors would still only pull the planets printed cards or resources even if a Harvester were there. I don't think this is right? I'm sure the +1C or +1R bonus also applies when you trigger Saellum Infestors' ability? I thought that the synergy with Harvesters was the whole selling point of the card, justifying its cost and unique status. Sorry Caldera, Tenerim is right on this one. The +1 (cards) and +1 (resources) symbols modify the number of cards or resources that are granted by a planet when the controller of the symbol wins a command struggle there. The card with the symbol must be at the planet when its bonus resolves. Their effects are cumulative, and their modification of the planet bonus is not optional. Thanks Asklepios. That's a shame. I still think Harvesters is a sound card but this reduces the value of Saellum Infesters even further in my view. Still, frees up some space on my Omega deck! What do you mean takes too long to infest? It's the same. Omega + Venomthrope = infest turn 1. Omega + Harvesters + Nesting Chamber = infest turn 1, unless you spam the planet with another Genestealer to infest during Deploy Phase. Venomthrope is simply too valuable. It wins command alone. Harvesters, to me, are the situational include. In fact, replace those Scything Hormagaunts, imo.